Piers Browne | Poetry Books. Piers has carved out a reputation as a traditional landscape painter-etcher - more recently of seascapes oils too, but is known also for his handmade books - to date three of the 8 books he has done are 'handmade' in editions of no more than 25, real collector's items. What is special is his ability to write POETRY, some acclaimed, and to illustrate it - which convinced the Bodleian (Weston library now) Museum in Oxford & Cambridge University Library plus seven 'private' patrons to buy 10 of 20 of this about 19" (49cm) high x 12 (31cm) wide handmade book 'Sonnets for a Siren' shown below. The edition 20, handmade as the type is handset by Hand & Eye Letterpress in London and the etchings are all original and bound in equal amounts. 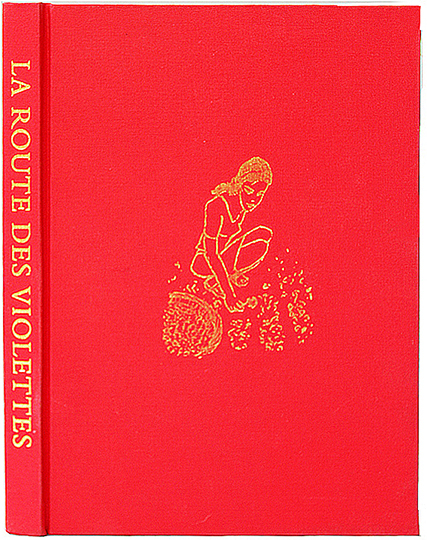 There are illustrated with 21 etchings mainly in monochrome 27 sonnets. There are some of this book left: in a leather binding (as below) there is one still left, while in buckram there are four left at last count Sept 2017. PB hardly ever publicizes these ever...he needs an agent as he is always on with other creative things and also these books are not be be left at his exhibitions. There is a catalogue,m so this can be posted t you hardcopy for free. The other handmade books were of Housman's poetry and of Wordsworth's - the 27 sonnets in the SIREN are PB's poems & 21 etchings. (Below) Jacket of 'SONNETS. FOR A SIREN' showing real silver tooling BEAUTIFULLY EMBOSSED onto one of the ten leatherbound books, fore and aft. PB began life as a 360 line poem. But after a year decided in 2016 PB decided it was best written as a short'ish novel of just over 35,000 words. Hopefully, when an Agent is found, it is may be taken on by a publisher in a larger format with corrected text and 3 more short chapters and 5 more etchings therein. PB says: "It's 50% all round better than the false start". NB There is a Catalogue for the pictures done in 2018, that is 29 etchings. So 95% of the pictures are in this earlier little full colour catalogue and costs £4 and can be be posted to you First Class - 75p postage, or it can be emailed to you by Piers on request. Who doesn't write usually poems or even make art when very moved emotionally? *First, PB's late wife Charlotte was photoed when engaged to Piers in 1984 summer when she was weeding (kindly and typically) in the garden: the inspiration for his heroine started with that photo! Also PB's son-in-law was brought up in his pre-teenage years in Tourrettes-sur-Loup, and had idyllic days with beautiful gutsy french school children - and now and again wonderful swims near Nice nearby down the valley. T-s-L is a very special place. 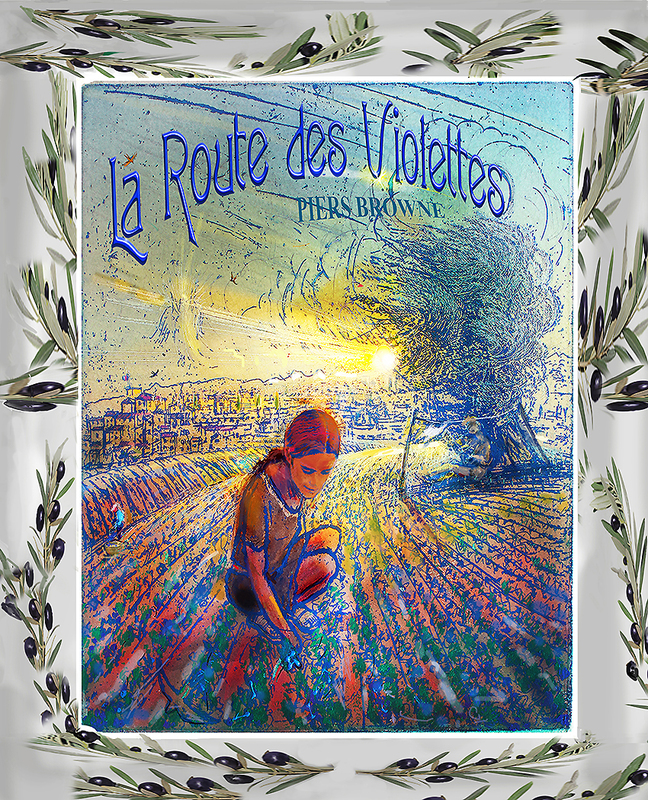 *Secondly, on visiting the village in 2015 PB found a leggy, dark Provencal young woman (happily engaged to be married) working in Tourrettes: Celia Domengo did some modelling for 'ELISE', the book's heroine who has such inspiring grace and a beautiful face and slim figure, traits which PB's late wife naturally inspired but sadly could not model. *Thirdly, HENRY', 'Elise's' lover, had a more embellished first love affair than mine when 14 years old : mainly PB danced the Twist with a french girl aged 14 in Corsica in the early '60s - the was a kick-off for this book's hero and is infatuation. *Fourthly: PB had an angelic event in 2002 and naturally had never forgotten that! Angels seem to keep themselves to themselves, but an extra-extraordinary Visitation took place to PB. The book is about an stubborn atheist meeting a very spiritual young woman, and their being denied marriage due to his lack of Faith. *Finally, PB found that Elton John, Mick Jagger and Bono all have villas close to Tourrettes and so, as Piers had as a hobby and once semi-professional life writing pop music - some turned into Popera 'Musical' music (two performed so far, and FREYA is touring the Dales this 2019 August), our hero usefully became a pop music writer. Piers: "Only in this novella luckily, I fear my heroine had an unfrotunate incident at dusk when she was fifeteen, and rushes into a nearby fictitious Tourrettes convent- the nearest is at Cimiez, northern Nice. While there for over a decade, Elise prays hard each day to see Henry again. She does not the least stagnate while, not even a Novice, she teaches children English, picks violets for her mother, and re-reads Henry's poems and looks at his drawings he made for her until the type is almost gone. Hero Henry, after a succession of failed relationships in London, does return to seek Elise out - a decade after their first kiss! That they renew their loving relationship is thus extraordinary. However, being under the Abbess' wing in her convent - another twist in the story - the very spiritually minded Elise is denied 'freedom' to marry the ardent atheist Henry. It is the way he is suddenly and completely converted - to gain Elise - that is the startling climax of the story. This is a 4 x 3" etching going into the [hopefully] NEW edition of La Route- when a publisher found. Piers seeks an agent, then publisher and hopes a translator will be accosted to translate it written into french. ACCOLADES from the pulped Ist small edition....how much better the accolades should be with the main edition soon! About 75 of the best small ORIGINAL ETCHINGS from all PB's books will be on show all September 2018 in Swaledale's HARTLAKE GALLERY in The Old School, Muker. There may be a video of PB printing and talking about some of the etchings and engravings from each of the 8 books. Only closed Wednesdays. Listed below are the 3 previous totally handmade books of which only the SONNETS book has copies still for sale... 'copies' a bad word as all are totally original. *WILLIAM WORDSWORTH: A LAKELAND ANTHOLOGY ed 10 slipcased 19" high x 12 wide, PB self- published 1990 and mass published ed 4000 by John Murray 1999 and winning the illustrated book of that year (One copy bought by Felix Dennis in 2005 for £10,000 that patron gave it to the Wordsworth Centre at Dove Cottage in Grasmere.) Handmade edition of 10 sold out in a month, and likewise the 4000 edition sold out. FOUR LEFT OF 20 slipcased 19" high x 12 wide, ed 20 (which PB would be happy at last to have published - he hasn't tried to 'til now) was another 3 year project finished in 2008. Ten have sold for many thousands to both the Bodleian Library in Oxford along with the Cambridge University Library for example. Approaching eight 'private' patrons only, he sold those and has thus left max of 10 as in the last Recession he made no attempt to sell them and the habit has grown! PB's handmade books are totally handmade, the type being usually handset by Hand & Eye Letterpress in London and the original etchings being bound in. PB says it took him a month to be satisfied in the writing of each SONNETS FOR A SIREN sonnet alone - there are 27 ! = about the time it takes him to make each of the 22 etchings. 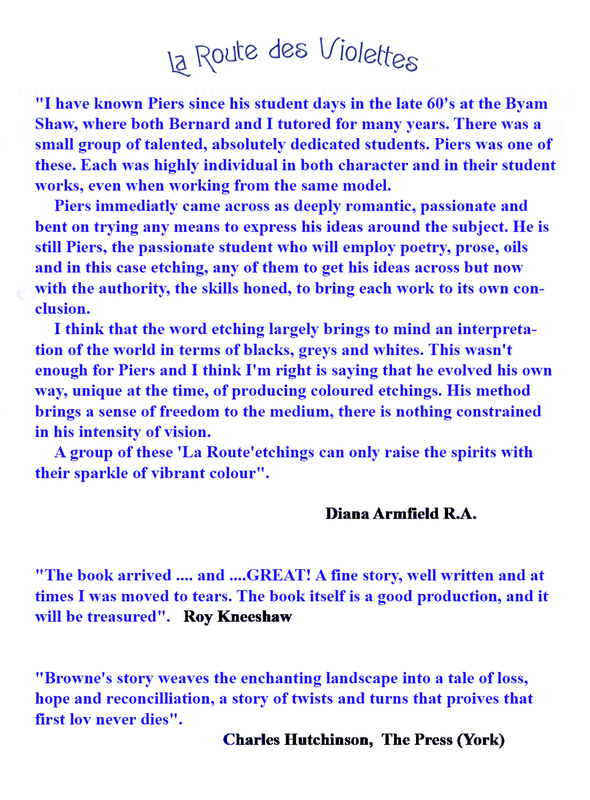 Foreword by Kinsgley Amis who loved Housman's verse, this was Piers' first handmade book (Edition of 25) and was begun whilst he was still at The Royal Academy Schools under the great Peter Greenham in 1972: PB finished it 10 years later. One copy was donated to The National Trust in Shropshire and subsequently raised a massive £5000 through a raffle. The proceeds were put to good use on the slopes of Wenlock Edge. The mass publication came out in 1988 with a new edition later. Although the new books are sold out, Amazon seems always to have a few used copies for sale. 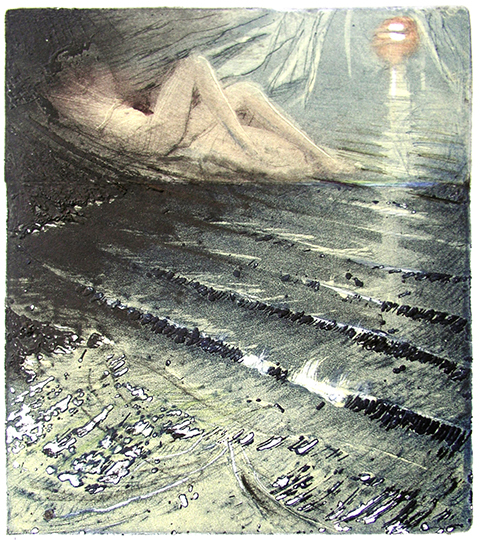 The etchings were exhibited at the Royal Festival Hall's Poetry Library in 1996. A few etchings are still some available from Piers, all 75 etchings contained were made in editions of 100. 'AN ELEGY IN ARCADY' - a black and white engraving- illustrated biography PB wrote and illustrated of A E Housman soon after he had completed the many colour etchings (1972-84) for A SHROPSHIRE LAD, his first success in the 'coffee-table sized book world book world. This,Piers' second book, was then published again for the mass market by Ashford, Buchan & Enright and launched from Brewer's Hall in the City of London in 1989. 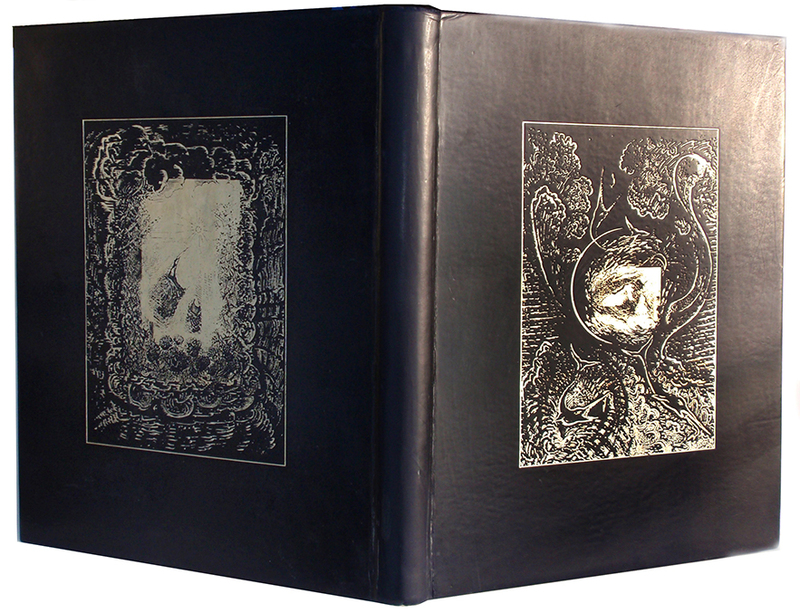 PB has in store not one copy of its edition (again 4000) left, but there are 4 boxed suites of book left from an edition of 25 (10 being 'harrowed' to sell the engravings separately when the artist's cashflow was tense! - and all the engravings opposite the well inner-cased book in a silver tooled presentation box. ingenious and smart. Each box contains the 33 engravings of about 6" x 8" high on handmade paper sized 11"x 14". The handsome large, deep box has a cherry tree in silver-emboss on the front cover against a background of apple green, price £2750. With a foreword by John Mortimer, Piers' third book was equal first in the WH Smith Illustrated Book of the Year Award, 1991. There are thirty-six selected Wordsworth poems with accompanying colour etchings and is a superb book for lovers of Wordsworth and the Lakeland landscape. Both the handmade and reproduced book versions sold out ages ago, but many original etchings are still available from Piers or selected galleries. This was, like 'A Shropshire Lad', originally handmade in an edition of 25 at a few thousand pounds each. The second of four mass produced, non handmade book from Piers. Only about 5 of 4000 remaining in PB stock - some in his galleries (see Stockist) and always from AMAZON! 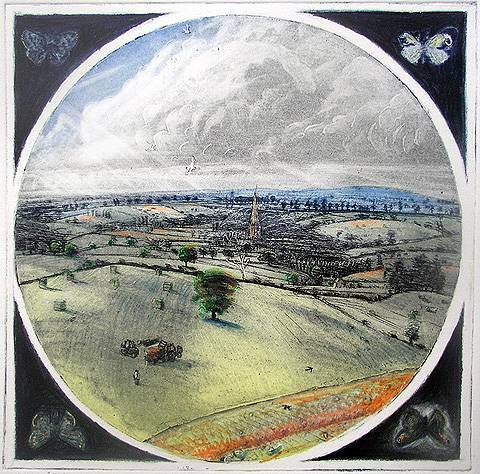 A celebration of Wensleydale: in all its seasons, moods and times of day, it has proved a best seller with 75 etchings of the Dale therein, some not editioned out. The pages are 13" x 18" high and the beautiful type, with much airy space around, was set, as with all Piers' handmade books, by the best, Hand & Eye Letterpress of London; the binding, three left with covers in calfskin, 10 with cloth, is embossed with silver images front and back which was done by Shepherds of London. Of all three handmade books, this one is 'purest', being most dignified and the most classically simple, the type again perfect, due to expertise of Phil Abel at Hand & Eye. A small catalogue can be sent to you gratis by Piers. In July 2009, the Bodleian Library in Oxford, and the amazing Cambridge University Library, along with 7 private 'patrons', received their orders of a leather bound book. In an edition of 20, all theirs are from ten leather bound copes in the edition, with the remaining ten, though similarly embossed with real silver on front and back jacket covers, are cloth bound, so a shade paler and £500 less than the £3500 price for leather-bound copies. 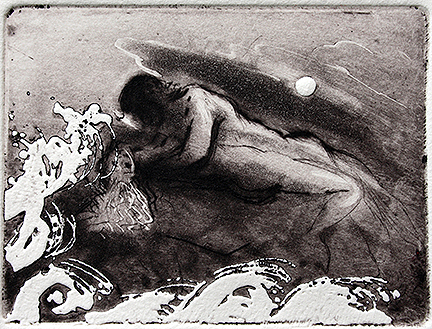 Most of the small etchings - this one on the right is 5" high x 6 across - are entirely sea with some landscape orientated, and about 6 are larger at about 8 x 6 inches, with all 19 printed directly from the hand-inked plate, (hand-inked by the artist only) onto this large book's every-other-left page facing the one of the sonnets. As each original print costs around £200, and the fantastic length of time and cost of printing and then binding was about £2000 each book, each Handmade Books must surely be a great bargain, especially as in the hands of an Agent/gallery the book would be more. 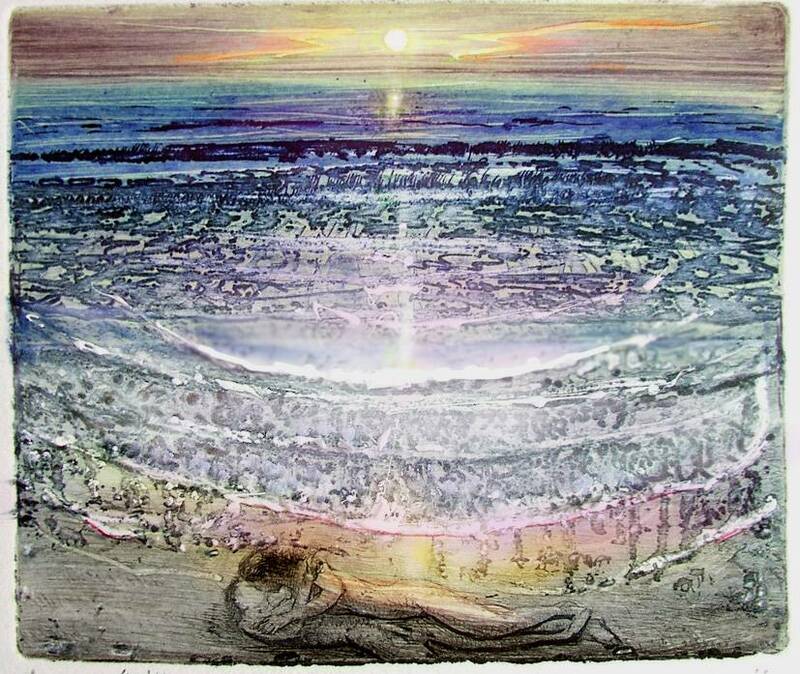 Costs of 'Sonnets for a Siren' (which is not mass produced yet fpr personal reasons) are £4750 per leather book and £4000 cloth. The cost NOW is near equal to that PB paid to make each book - the binding and especially silver embossed jackets were a weighty price, but the time spent making the whole book meant it was indeed a labour of love. 'LOVE IN THE AEGEAN' (32 pages, 22 poems,22 pictures: 1/2 PRICE @£5 each Signed) is in an edition of 200 privately and beautifully bound and sold by Piers from home. 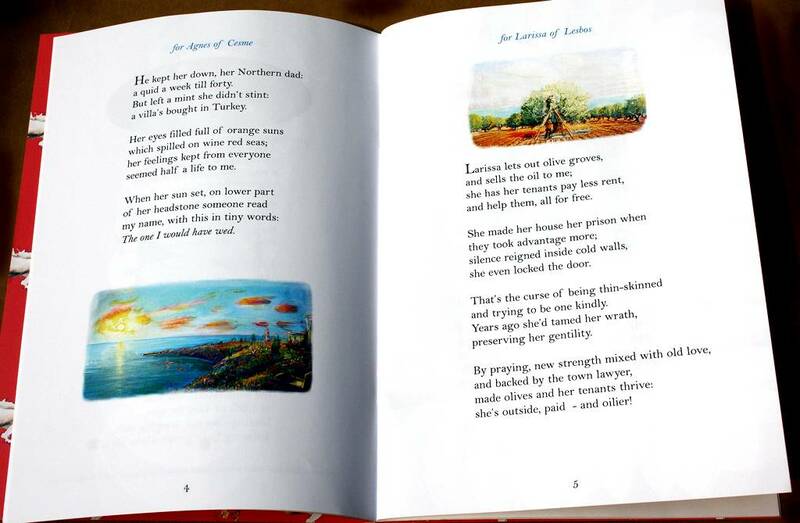 The POETRY LIBRARY in the Royal festival Hall have two copies & some are for sale in Hay-on-Wye's Poetry Bookshop. This was probably Britain's first E-book in that you can see every page and turning the pages is fun! -by logging onto: www.artists.ltd.uk/pb.... hope still working. Only literally a 100 of the 4000 left, so £35 is the priceand £3.50 P&P .Some are available from PB's galleries' stockists - see under either ETCHINGS or OILS FOR SALE for lists, as you may more than likely find a few signed copies still at any listed in the OILS or ETCHINGS for sale files on the www. DAWYCK ARBORETUM in Peeblesshire now stocks this TREES books. That incredible Border's Pinetum was where Piers etched some of the highest Douglas Firs in the UK. 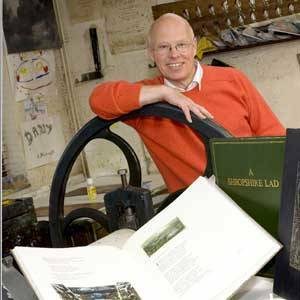 The book contains nearly 170 reproduced etchings of trees in romantic landscape from John O'Groats to Lands End, and N Ireland to killarney in s.w.Eire. It was critically very well received. HRH Prince Charles wrote the Foreword and Prof David Bellamy wrote each tree species' Chapter starts. 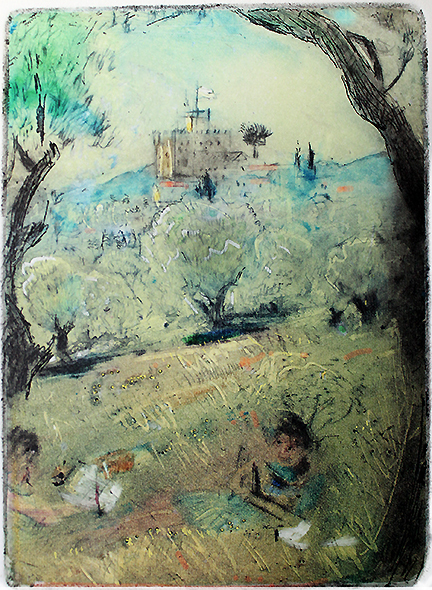 a group of the ORIGINAL oils/watercolours/drawings + their resultant etchings as reproduced in this large book... galleries do enquire as that would make a lovely show. 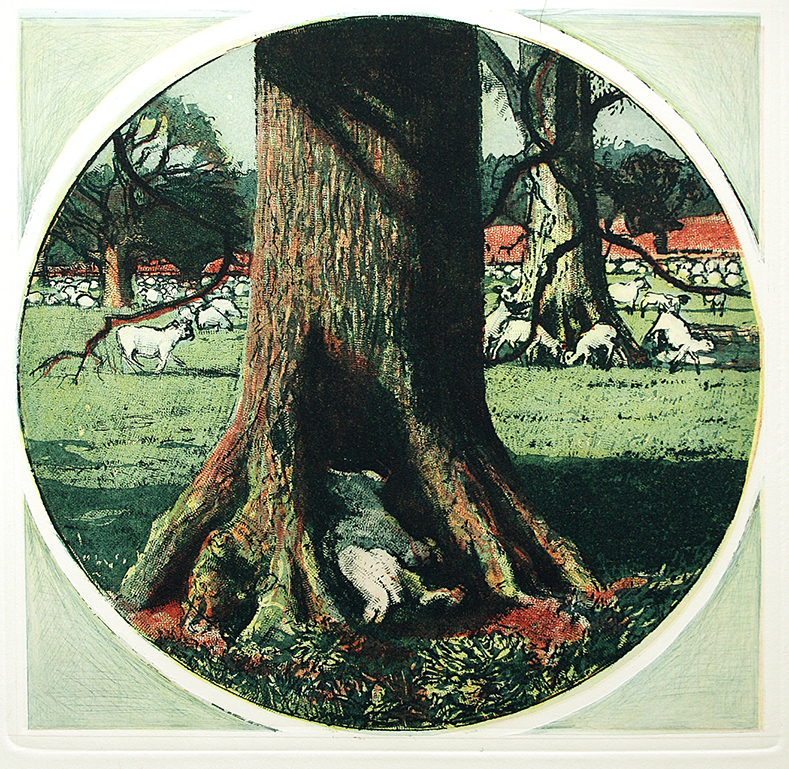 "I am full of admiration for Piers Browne's beautiful etchings in his latest book". "Only someone who is both an accomplished artist and who cares passionately about the countryside could have produced such beautiful etchings as seen in the Wensleydale"
The Poetry Library bought a copy and had exhibited his etchings. 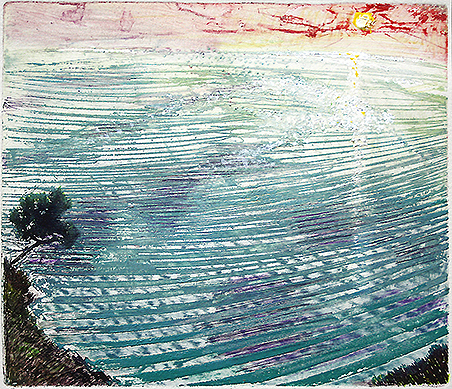 Piers etches as much as paints - and still adores the Wenslydale landscape and British seascapes - but the fluidity and chance of immediate texture with oil paint is hard to beat. 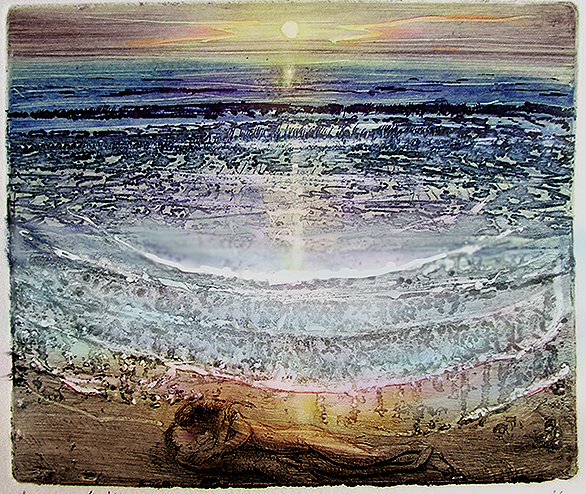 "I find the etchings hauntingly and evocatively beautiful. In fact, having seen your work, I hardly dare do any more painting myself"
"Piers is a true Romantic, dedicated simply to his art." .....is a light (in all ways) is a slim volume imagined more than re-enacted in love poems made from experiences over the last two decades in mainly the Cycladic Isles of the Aegean and Turkey’s wonderful west coast. They are real love poems, all 24, with 19 illustrations from oils done by the artist. 'Piers Browne's LOVE IN THE AEGEAN is warm with Mediterranean colour and light, a lyrical introduction to the place that gives him life'. 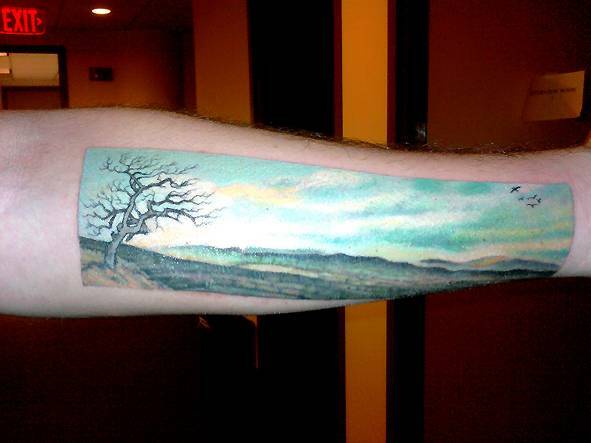 Ben Radlinski is, who inheriting his parent's collection of Piers' etchings from A SHROPSHIRE LAD which they bought over the years from the late 70's, had his arm tatooed with one! Actually the etching is one of PB's favourites. Most of the 40 or so etchings in the book were in editions of 100, so bound to be a few left. 'A Shropshire Lad', the book, is well sold out - available, like many, from Amazon. An etching from A SHROPSHIRE LAD (below) then Piers leaning on his Etching Press with one WILLIAM WORDSWORTH: A LAKELAND ANTHOLOGY handmade book.